The Lundar area offers hunters of all types some fantastic opportunities. For big game you can pursue black bear, deer, and elk. Lundar also provides an excellent habitat for a variety of migratory birds (Geese/ Ducks/Sandhill Cranes) and Upland game bird which makes an excellent opportunity for hunting. Lundar is also the host of the Annual All Canada Goose Shoot. 16 teams, 4 members each, compete for prizes and trophies by bagging the largest legal number of geese on selected fields. Winter Ice fishing as well as Angling in the summer. The Lundar Trap Club has been in operation for over 30 years.They promote junior shooting and have a junior shotgun program every spring for youth aged 12 to 18. 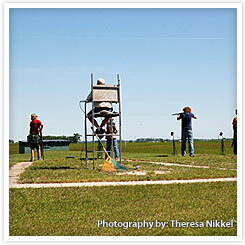 There is an annual Registered Trap Shoot as well as a fall Ducks Unlimited trap shoot.